My Kid Lied To Me !! 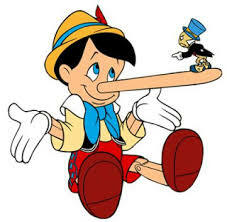 It is not new or rare for a parent to realize that his child is prone to telling lies. This may not only be an odd situation for a parent but is worrisome too. When a child tells a lies, as parents we tend to feel hurt and angry. As parents we tend to take the episode personally and feel that children cannot be trusted. In this article we discuss this particular yet common behavior amongst children. 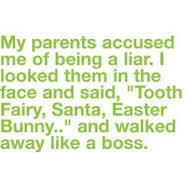 Parents often complain about the “kids lying behaviour”. Some fear that the children will become dishonest and immoral. Some parents may blame the peer and other people the kids are mingling with and suggest taking strict steps to discourage children. No doubts that the behavior requires to be checked and discouraged but do not panic. Avoid shouting or punishing the child. It is important to handle the situation smartly and with patience. Understand if the child understands the difference between fiction and reality. There are chances that children do not have an understanding of differences between fiction and reality. Santa may visit the child often, even if it is not Christmas season, Superman, Spiderman and even Doremon may be other common visitors. Children may also come up with stories that may be completely unbelievable; Grandparent trying to wear his or her clothes, an imaginary friend who is everyday in a pink frock; someone else pulling the cat’s tail are just some examples. Saying that he has not peeed in his diaper in order to avoid a change may be common for toddlers, while pre-schoolers may come up with more creative stories. It’s important to take into consideration the age of the child and the nature of lie that the child is telling. There is a saying that children do not lie. Some parents take it very seriously. It is true that children will tell a spade is a spade. However, they can lie when they feel that if they say the truth you may hit them or scold them. Let us look at some ideas to deal with the situation better. It is natural for kids to tell a lie. Most of the kids lie to protect themselves from punishments. It is also said that those who lie also have a better IQ compared to the other children. Children of strict parents tend to lie more often. The second point is that you have to understand why the child is telling a lie. You have to locate the root cause of the lie. So try to become more sensitive and understanding to the child and you will you be able to manage your child better. Children have self respect. Even children have self respect and they don’t want to be shouted at. Do not push them to a situation where speaking a lie helps them avoid punishment and being reprimanded. Observe the pattern. You have to understand the pattern of how a child is lying. For example some children make stories about things that never happened. This can be their imagination you cannot say that your child was telling a lie as he made a story of demon that was attacking him. Some children hide their grades, while others may lie about a pain to get attention. Some children may lie after they have broken something or eaten something they were not supposed to while others may have absolutely no reason for doing so. The last situation can be actually worrisome. If the child is telling a lie for no valid reason whatsoever then you are in trouble as telling a lie has become a part of his nature. Take it seriously asap. When should you take the kids lying behaviour seriously is a question many parents ask. Well at the earliest. You must make it clear to the child that he or she cannot get away with a lie. The lie has to come out in some form or the other. Once this becomes a habit it will always stay with the child. Never draw comparisons. Never compare the child with another as this can make them very insecure and angry from within. Each child is different as each parent is so comparisons will never get you any positive results for sure. Encourage them to share. Some children are physically abused and they really do not know how to speak about it to the parents as they don’t even understand what is happening. They may lie to the parents as they would not know how the parents will react. This is very sensitive issue and you must be friendly and sensitive to the child. If you notice any changes in bbehaviorof the child ask them what happened. If they don’t tell you keep asking unless they confess. The most important part is trust the child completely in this matter. Also tell them that hiding a fact is as good as telling a lie. Listen patiently. If the child comes to you and confesses something that he or she has done. Do not over react or scold the child. First praise the child that he or she took the courage to tell you the truth. No matter what age you are it takes a lit of courage to tell the truth. Then tell them not to do the mistake again. Conveying messages through stories and fables. Watching out your own behavior. Helping the child understand the difference between truth and false. Do not hit the child for he or she may become a rebel. Be a friend of your child. Talk to them, spend time with them and grow along. Do not spy on them and avoid broaching topics that they are not comfortable talking about. The kids lying behaviour is indeed a big problem. It can start as early as three years or even two years age and can become graver if left unchecked or dealt incorrectly. Complex lies can lead to problems and that is the primary reason why this behavior should be discouraged at the earliest.